The AMG 43 range are powered by next gen 3L V6 twin turbo engines, with performance almost matching that of Porsche’s latest 991.2 3L flat 6 TT! Will you still worship the new era Carreras now? 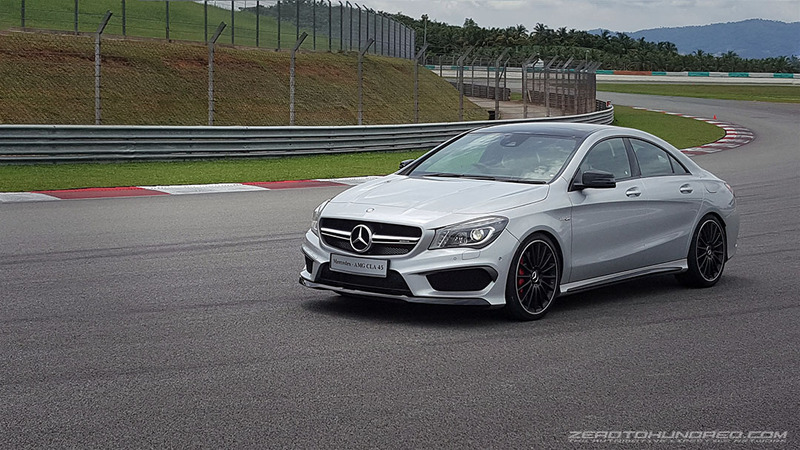 I was privileged to sample the new 43s last week at AMG’s 50th anniversary tribute event, which was held in Sepang Circuit. Almost every current AMG car was represented on site, for a day out with the journalists. It was jaw dropping. 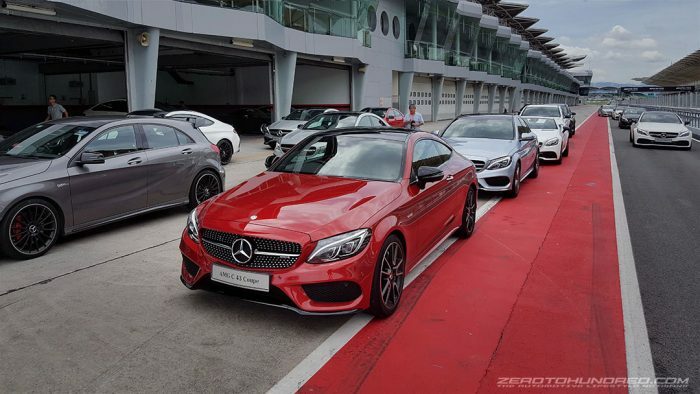 Following the massive success of AMG’s 45 series, they’ve just deployed a new range of AMG cars and yes, the whole gang is now here in Malaysia (except the even madder GLE43) so expect a brand new breed of fast sleeper Mercs real soon. The birth of the 43 series makes owning a true AMG car more attainable for current fans. It’s a great slot below the beastly 63 series yet more mature than the racy 45 series. Fine, it’s no where near the pedigree of Stuttgart’s finest and yes, the 6k ish rpm range falls short of Porsche’s class leading 7,500rpn music. If there’s any consolation, the stated engine similarities still stand. Even the high pitched exhaust sound almost similar in tone. What the 43 series is, very simply, a fully loaded Merc but with the beating heart of AMG’s latest power and drive train. It’s got more pronounced bumpers and accents but retain base form, so no widebody business here. Think of the AMG 43 as the most extreme line of Mercedes cars that sit just under the full monty V8 AMGs. This first impression is based on my drive in the AMG C43 Coupe. But having operated the GLC43 as well, I would say they posses similar drive experience only differentiated by platform type. AMG’s new 3L V6 twin turbo is good for between 367hp (powers the entire range) and 401hp, special to the E43 4-matic only. But they all make 520nm and that’s a big number. 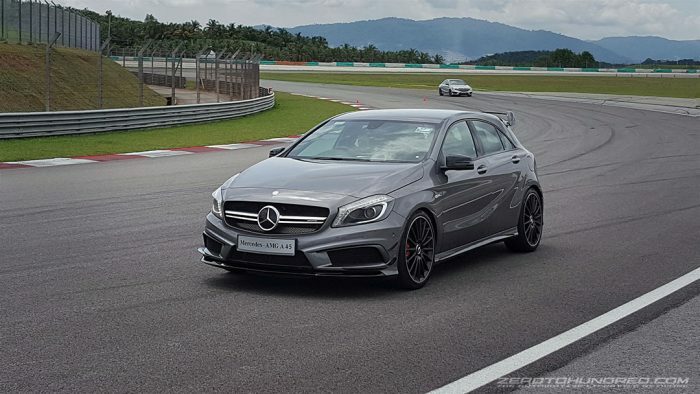 Zerotohundred for the entire AMG 43 range stands at 4.7 seconds, while the E43 manages 4.6 seconds which is impressively quick by sedan standards and will all do 250kmh at terminal velocity. 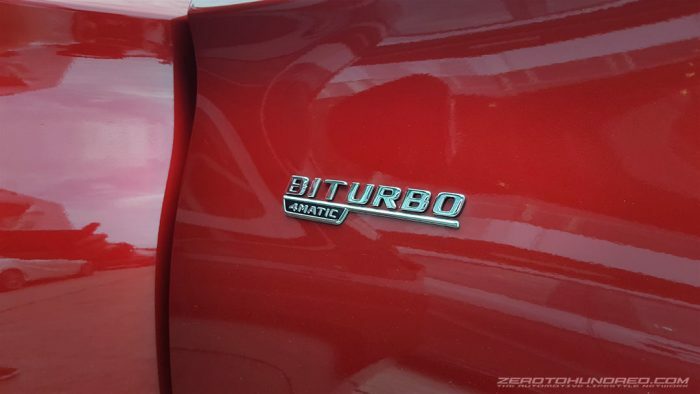 As for how the V6 Bi Turbo tastes? It’s likely the purest, most silky 6 cylinder I’ve ever encountered. It is also very, very linear. In fact it responds like a big 4L NA or perhaps more linear than that. But it feels almost synthetic. I sense plenty of e-trickery going on in the background striving to deliver this super smooth signature AMG 43 sensation. Did I mention the C43 Coupe weighs in excess of 1,700kg? Yes, it’s pretty hefty just like the regular C300 Coupe. But in the 43 series, suddenly the new AMG Coupe feels light and agile. New 367hp has definitely added lightness to the big coupe but to be honest, power isn’t the biggest contributor here. In truth, this nimbleness come from a trifecta of new age adaptive suspension, transmission and power distribution. AMG’s adaptive suspension is a version of modern active suspension systems. In here, electric shock absorbers compensate for road condition and driving input, therefore delivering a tailored ride. It is a feature that technically guarantees far superior ride and handling in just about any car. These adaptive dampers deliver far better ride than the parent company’s recent try at mechanical shocks and springs in regular C class cars. There are 3 damping modes to match the mood, “Comfort”, “Sport” and “Sport Plus. 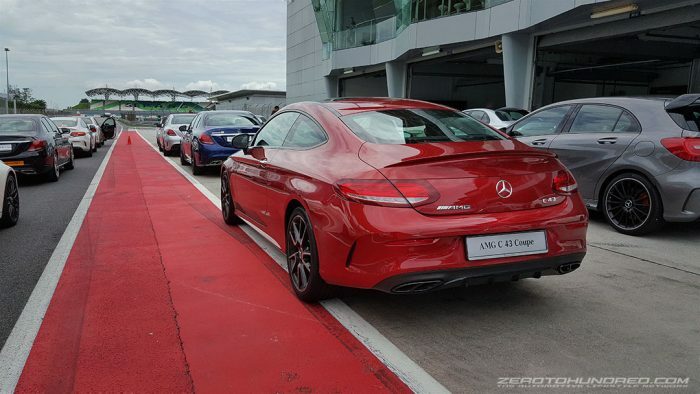 On the circuit, the AMG Coupe’s talent for corners shows. I am certain it is even better than the C63s Coupe, which felt monstrous and uncompromising, sprinkled with a tinge of steering lag as mentioned in my recent review of the beast. In the C43 Coupe, there is a noticeable steering sharpness that wasn’t there in the regular coupe for one, and at the high speed turn 12 corner, I was amazed by its steering precision yet again but mostly at how flat and planted the coupe was. It was when I felt for the first time, a murk that actually can and wants to play. Such immense performance wouldn’t have been achievable if not for their latest 9 speed automatic, the 9 G-Tronic which sits at the pinnacle of slush box tech. Needless to say, the more gears, the quicker things get. With additional gears at its disposal, the C43 Coupe gets an extra shot of immediacy, further cementing its awesome lag-free punch. This new 9 speed is faster than ever before and promises the latest in driving gimmicks such as more aggressive upshifts and downshifts, with the added effect of rev matching, akin to manual heel and toe. Generally, the 9 gear slushbox is smooth and quick, almost DCT- like, almost. But compared to its previous 7 speed, the current 9 G-Tronic is almost faultless. I detected no clunks and as far as my drive went, the ‘box is precise and feels robust at every shift, all lap, every lap. Even while under the full afternoon sun. Activate manual shift in Sport + and the C43 Coupe shifts with double the ferocity. Its instrument cluster also displays a game-like upshift reminder when the mode is activated. Be careful though, this being full manual mode means full manual. At the rate the revs climb, it’s really easy to hit the limiter and chances are, you’d be greeted with a sudden forward lunge as the transmission waits for you to make that shift. That’s also because the G-Tronic tends to shift a couple of hundred RPMs earlier than expected. The 4 Matic is in my opinion, one of Mercedes Benz’s greatest achievement, regardless where they rank in the 4WD tech war with Quattro. Mercs just drive better with 4-matic, like condiment to your favourite dish, the 4 Matic is sauerkraut to a bratwurst. With drive to the front wheels, the AMG C43 Coupe becomes more capable, adding dollops of precision to its steering and above all, an overall sharper demeanour. This ability is completely absent in their non AMG, mere mortal versions of the C class. This dynamic AWD system by default operates on a 31% front and 69% rear torque bias. So, better grip anywhere improved traction at full acceleration, and accentuates the AMG 43’s driving characteristics. To ensure this sharp increase in performance can be fully capitalised, all AMG 43 cars will feature 4-matic drivetrain. All but the SLC 43, which is justifiable for a convertible roadster. A line-up of superstars joins the family of thoroughbreds. 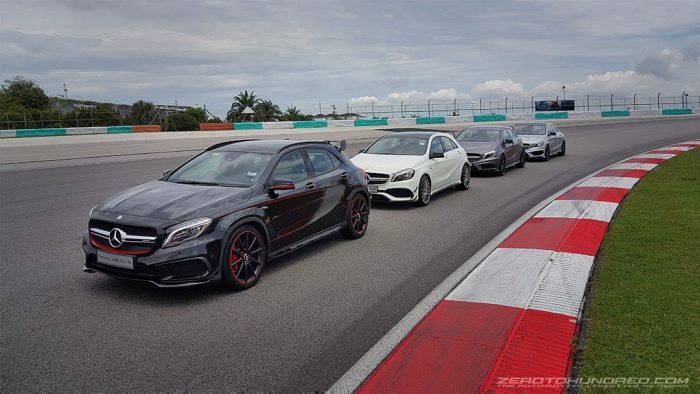 Mercedes-Benz Malaysia celebrates Mercedes-AMG’s 50th anniversary with a firework of new driving performance models. The six Mercedes-AMG 43 series models are no compromise racing machines with a luxury appeal combined with the AMG pedigree and a thirst for speed. AMG rear axle differential lock is available in the SLC 43 for improved traction in all driving situations. The Mercedes-AMG SLC 43’s vario-roof combines open-top driving pleasure with uncompromised comfort in poor weather. Operating the electrohydraulic roof is now even more straightforward. If the vehicle has to move off while the roof is opening or closing, the process which was started when at a standstill can be continued up to a speed of approx. 40 km/h. Another new feature is the semi-automatic boot separator in conjunction with the vario-roof convenience feature or KEYLESS-GO: if the separator is in the upper position for increased boot capacity, it automatically moves down when the roof is opened. The sporty, striking exterior design of the Mercedes-AMG C 43 4MATIC is based on the AMG Line exterior and is augmented with specific features. 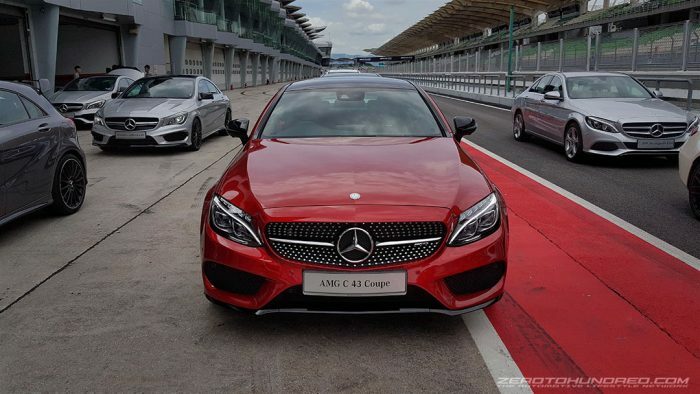 These include the diamond radiator grille with pins in chrome with “AMG” lettering, the “BITURBO 4MATIC” badge on the front wings and the two tailpipe trim elements in a twin-tailpipe design plus silver chrome-coloured and high-gloss black detachable body parts and trim. The AMG spoiler lip on the boot is the same as the one on the AMG Performance model. 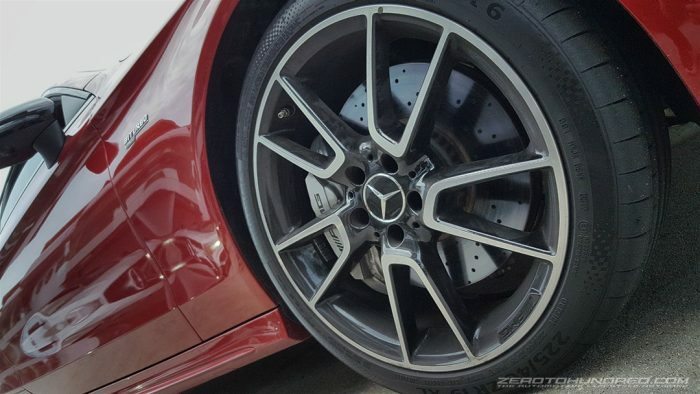 19-inch AMG 5-spoke light-alloy wheels painted in high-gloss black with a high-sheen finish round off the design visually. The new C 43 4MATIC Coupé never stops challenging as it fulfils the brand promise of ‘Driving Performance’ in every respect. The 3.0-litre V6 twin-turbo engine provides impressive performance with its 270 kW (367 hp) maximum power and peak torque of 520 newton metres: sprinting from rest to 100 km/h in 4.7 seconds, its speed is electronically limited at 250 km/h. The Mercedes-AMG C 43 4MATIC Coupé is outstandingly sporty in appearance, making it instantly recognisable as a member of the AMG family. 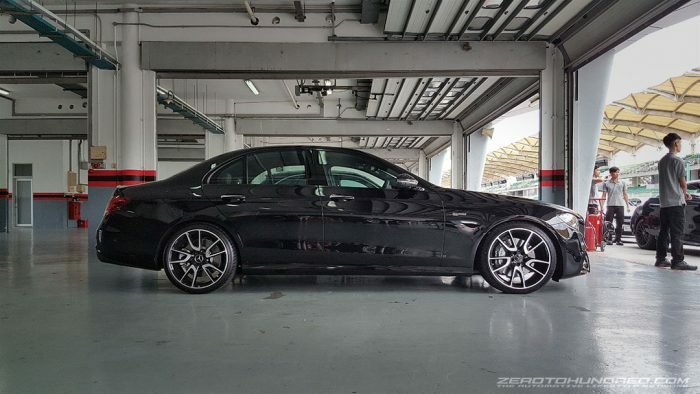 Characteristic features include the distinctive AMG styling as well as the specific light-alloy wheels. They underscore the brand’s progressive nature and performance. The engine cover with red aluminium insert accentuates the strengths of the new biturbo six-cylinder engine. Additional highlights include the black exterior mirror housings, the high-gloss black waistline trim strip and window frame, as well as the two chrome-plated tailpipes with centre divider. Further striking features come courtesy of the new “BITURBO – 4MATIC” lettering on the front wings and the “AMG” (left) and “C 43” (right) lettering on the boot lid. 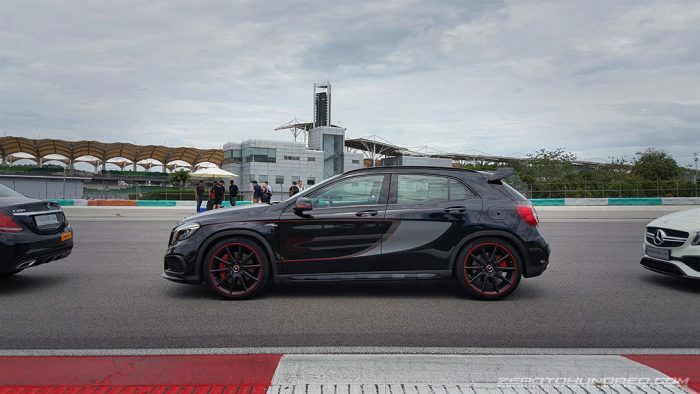 High-gloss black-painted, high-sheen 21-inch AMG 5-twin-spoke light-alloy wheels dominate the side view. There are also high-gloss black door mirror caps and the silver-coloured “BITURBO 4MATIC” lettering on the front wings. The tail end also sports characteristic highlights and exudes sporty, aesthetic appeal with two four-pipe chromed tailpipe trims. With Night Package, striking design elements in black underscore the sporty, expressive character of the vehicle. 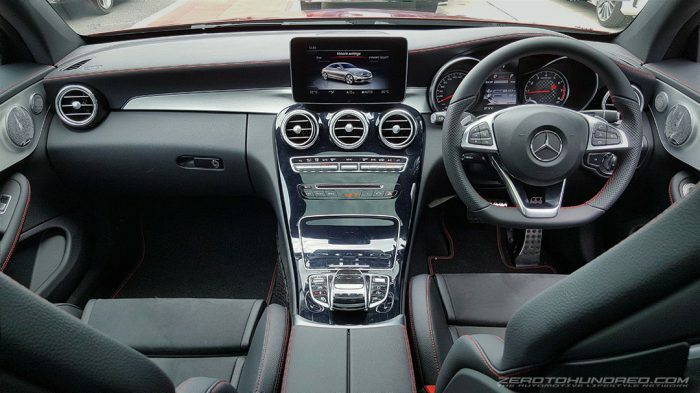 The Mercedes-AMG GLC 43 4MATIC Coupé combines a sporty, elegant design with the brand’s hallmark Driving Performance and the advantages of an SUV in terms of seating position, interior flexibility and also traction off the beaten track. In this anniversary year, with an eye to the future, Mercedes-AMG will carry on the exceptional success story of what began as a two-man company. For each of the now around 1500 employees, the focus will be on the brand promise of “Driving Performance”, which unites the core strengths of AMG: cutting-edge technology and a passion for dynamic, emotively appealing products. The company from Affalterbach stands worldwide for outstanding engine expertise, which includes not only development, but also the “one man, one engine” philosophy, which means that each engine is, so to speak, hand-crafted by one engine builder. With almost 100,000 units delivered in 2016, i.e. over 40 percent growth, and the biggest strategic model initiative in the company’s history, AMG heads into this anniversary year with record figures under its belt. With Agility Financing, customers enjoy cash flow flexibility. 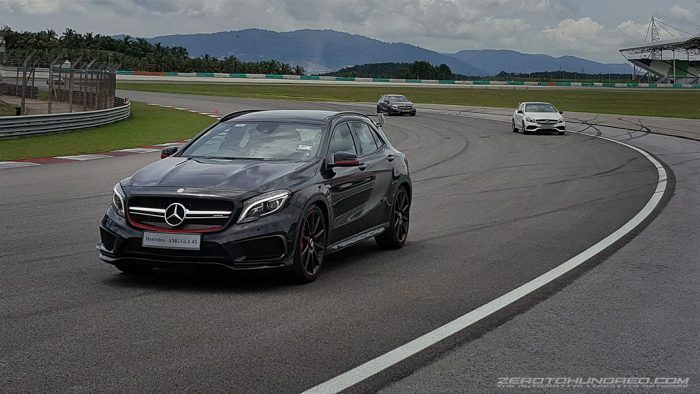 The instalment for five years Agility Financing plan, based on a 20,000km mileage per year for the Mercedes-AMG C 43 4MATIC, is at RM 4,998* per month. In comparison, the monthly instalment for five years conventional financing plan (interest rate at 2.08 percent), would be RM 6,576. At the end of the agreement, customer is in control with the options to settle or extend a financing contract or even return their vehicles and upgrade to newer models. Return option is subject to fair wear and tear conditions and kilometre restrictions. For more details about Agility Financing, call 1-800-22-6237 or visit www.mercedes-benz.com.my/agility or download the myMBFS app from Apple’s App Store and Google Play Store. Monthly instalments for both Agility and Classic financing above are based on the downpayment varying from 27% to 33% with 5 years tenure. For Agility Financing, it is based on 20k km mileage per annum. Terms and conditions apply.